These three big-name industrial companies have been ugly investments in 2015, but 2016 should be the perfect time to own them. 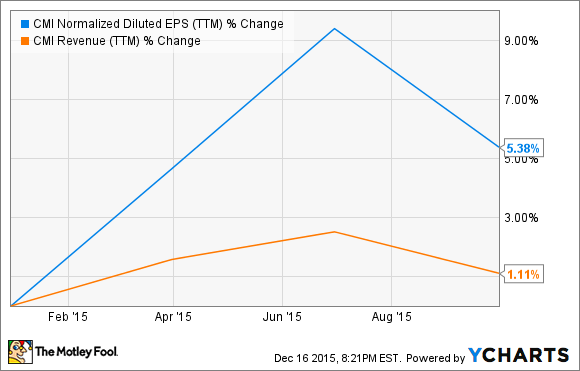 A lot of big-time industrial companies have struggled during the past year. A strong dollar, weak energy and materials industries, and slowing growth in Asia all played big roles in sending shares of PACCAR Inc. (NASDAQ:PCAR), Canadian National Railway (USA) (NYSE:CNI), and Cummins (NYSE:CMI) well lower in 2015. And while the challenges these companies are facing may not be over yet, they are high-quality businesses that are at the top of their industries. 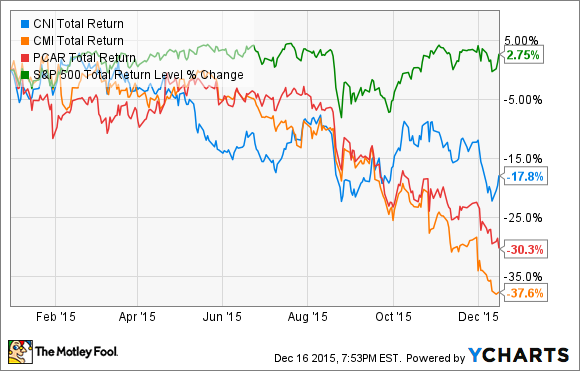 After this year's big beat-down, all three are set up to be top industrial stocks for 2016. Let's take a closer look at why. Diesel engine leader Cummins is dealing with an interesting set of challenges. With more than one-third of the company's sales coming from overseas, the strong U.S. dollar is hurting its profits. Cyclical weakness in a number of major industries Cummins serves has also slowed growth. The resurgence of the North American truck market has been more than offset by cyclical downturns in a number of industries around the globe, including mining, oil and gas, and pretty much everything in China. But despite it all, Cummins has maintained a strong business, and turned in results that should be lauded. The company has managed to hold revenues steady -- even after currency exchange impact -- and grow earnings per share 5% in the midst of an ugly demand environment. Cummins also has an incredibly strong balance sheet, with $1.7 billion in cash, and about the same amount in low-cost long-term debt. Yet in its fear, the market threw the baby out with the bathwater this year. Income-seekers should be lining up looking to buy. After a dividend hike earlier this year, Cummins is yielding 4% at recent stock prices, and the company has a 20-year history of regular increases. Even if business does slow a bit, that dividend makes it easier to wait for the next growth cycle. Canadian National Railway has seen shipments of coal, iron, and oil fall, as commodity demand weakens and prices plummet. 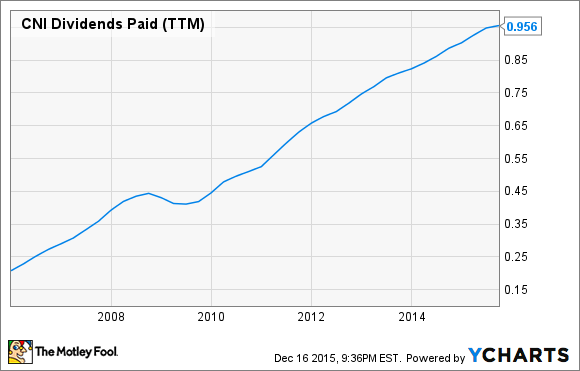 Gross ton miles -- a measure of "total stuff carried -- actually fell 5% last quarter. Yet in that weakening demand environment, the railway, which operates in Canada and the U.S., has done an excellent job lowering costs and focusing on efficient operations. CN managed to increase revenue a modest 3% with price increases and growth in key segments like car shipments, and pump up earnings per share an impressive 18%. Freight per train load increased 2%, miles per car of freight increased 10%, and the decline in oil prices that hurt shipments also cut the company's fuel costs significantly. Add it all up, and CN recorded a best-ever 53.8% operating ratio in the quarter. For context regarding how good CN is at leveraging its assets, competitor CSX Corporation also reached a record-best operating ratio in Q3, at 68.3%. Lower is better, and CN is simply the top railroad when it comes to efficient operations. Furthermore, CN is also setting itself up for years of steady business and growth. Most recently, the railroad has firmed its ties with multiple Gulf Coast ports, setting itself up to be a shipper of choice for companies looking to take advantage of the huge upgrades at the Panama Canal, which will significantly increase the amount of freight going to and coming from Asia via those ports for years to come. Canadian National also has a pretty extensive history of regular dividends and increases. But since that dividend is based on Canadian dollars, what you receive -- if you're an American investor -- will fluctuate with exchange rates, and could be subject to some additional taxes. Nonetheless, those minor concerns don't make CN any less of a strong investment for the long-term. PACCAR is a dominant player in medium- and heavy-duty truck sales in North America and Europe, with its Peterbilt, Kenworth, and DAF brands all commanding significant market shares. Every quarter this year, PACCAR has reported record sales and earnings results in what has become the best year for truck sales on both continents since before the global financial crisis of 2008-2009. Yet Mister Market has continued to sell off the PACCAR stock like there's no tomorrow. Or more accurately, like there'll be no truck sales tomorrow. In fairness, most industry estimates are that North American truck sales will slow a bit in 2016, though they may grow in Europe. Yet whether they stabilize, slow, or grow slightly, PACCAR remains the top dog, very profitable, and its stock has just gotten plain-and-simple cheap. It can be challenging to invest in cyclical industrial stocks -- especially if you invest on the wrong side of the demand cycle, or buy a stock that's overvalued. It can also be difficult to follow industry trends, doubly so when a company sells into multiple industries all over the world. Investors in even these three excellent companies have learned those lessons in recent years. But it's gotten to the point where the market is simply undervaluing all three, and by a pretty wide margin. 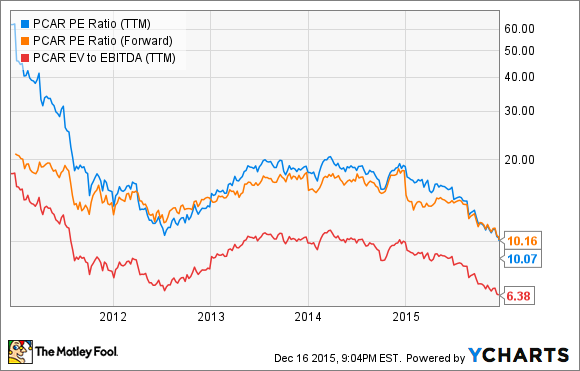 If you're looking for top industrial stocks to buy for 2016, look no further than these three.